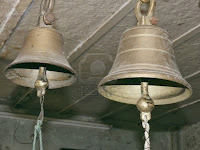 What is the inner significance of ringing the bell in a temple (any place of worship)? Bell serves as a visiting card to see God!! There is great joy even in listening. It is Naada (Divine sound). There is great power in sound. We have bells in a temple. All who visit the temple ring the bell. 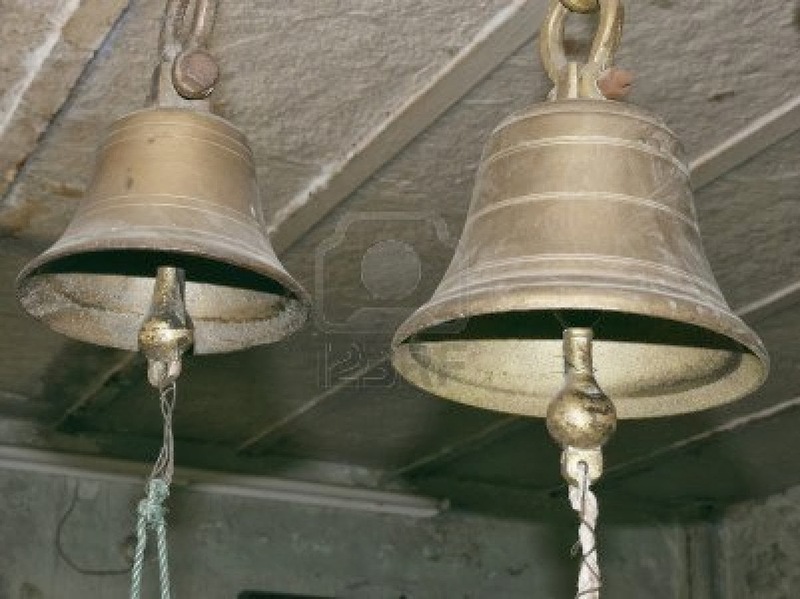 Why are bells kept in a temple? Are they kept to wake up God who is sleeping? No, no, no. Those who do not know Vedam, regard this very Naada as Vedam and make God hear this sound. Thus the vision of the Lord has to be turned towards us through the aid of the sound. But that does not mean we can make any type of sound. It must be the Omkaaram that is the combination of Akaara, Ukaara and MaIkaara. That is the correct address of God! The bell is not to be rung merely to silence a child that is crying (using it as a plaything to divert the attention of the crying child). What is the correct method of chanting Omkaara? The Omkaaram must be chanted in a very pleasant, sweet and soft manner. It must sound as though it comes from very far, approaches very close and then goes very far again. The people from urban areas must have experienced this. When the plane is flying somewhere far off, you can hear a little bit of the sound. When it comes close, the sound is heard very loudly. Again when it moves far away, the sound keeps on decreasing. Omkaaram must be chanted in a similar manner. 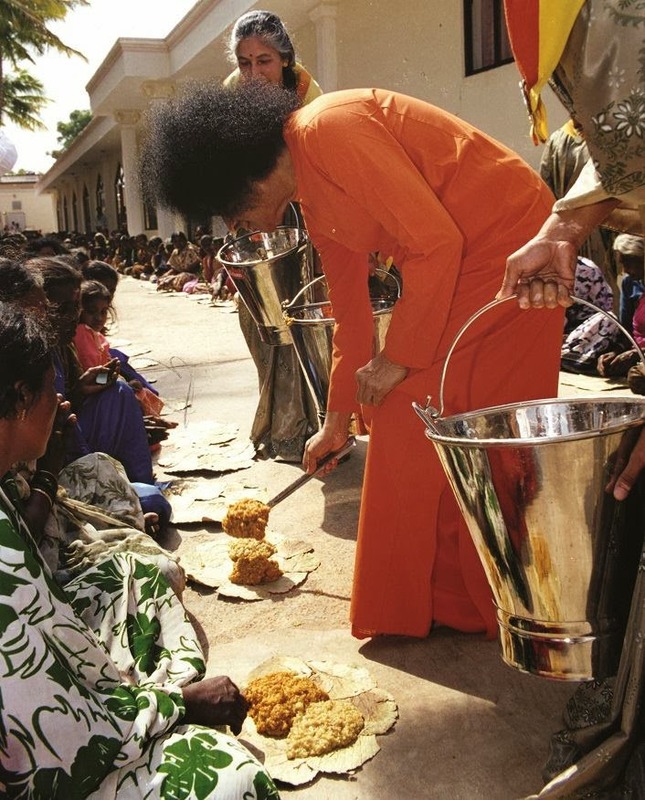 Swami demonstrates the correct method of chanting Omkaara. Omkaara has a spelling. In the case of God, we have the spelling G O D. In the same way, when Akaara, Ukaara and Makaara are joined, they become Omkaara. However, we need not go by mere spelling and chant Omkaara as Aaa Uuu Mmm. This is not Omkaara. The sound “Aa” must emanate from within. “Uu” must come from the tongue. “Mm” should emerge from the lips. The three should be united and there should be no gap in between. The three should be united and that is the proper way of chanting Omkaara. What are the nine heads under which Vedic knowledge has been propagated? These titles that have been given to the Vedas are embedded with lot of significance. Sruti means the disciple must listen to what the preceptor chants with all sincerity, repeat the same mantras with sincerity and thus acquire proficiency in recitation of the Vedas. Therefore Sruti means listening to what the preceptor tells with earnestness and then reproducing the same sounds in exactly the same manner. It must be practiced only through hearing. 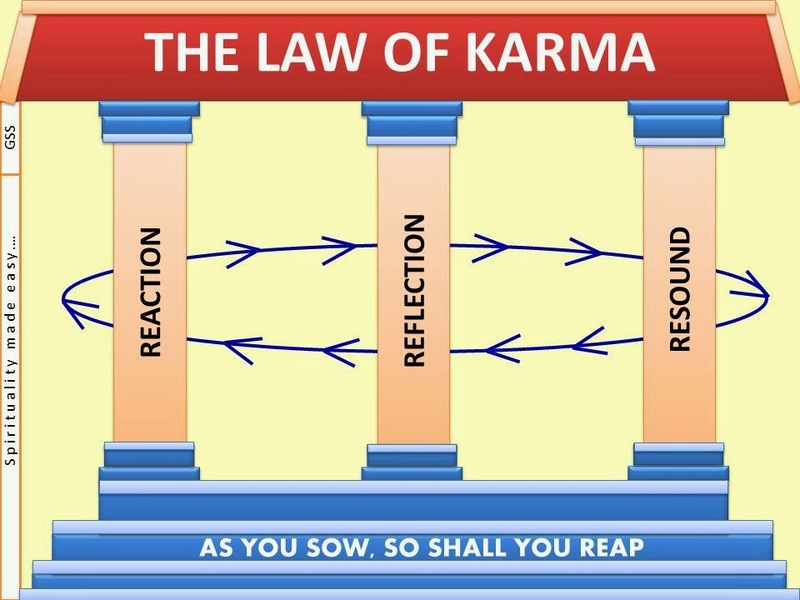 Anuswara refers to contemplating on that which has been practiced by listening and repeating and developing the same. Thus, the inner meaning of Sruti is listening, practicing, contemplating and thus imbibing the mantras. Earlier there were only three Vedas – Rig, Yajur and Sama Veda. These were also called Apourusheya (authorless – anonymous, or of divine origin). Atharvana Veda actually consists of some hymns taken from the Yajur Veda and separated out. As these three Vedas were called Apourusheya, they were referred to as Trayee (the triad). 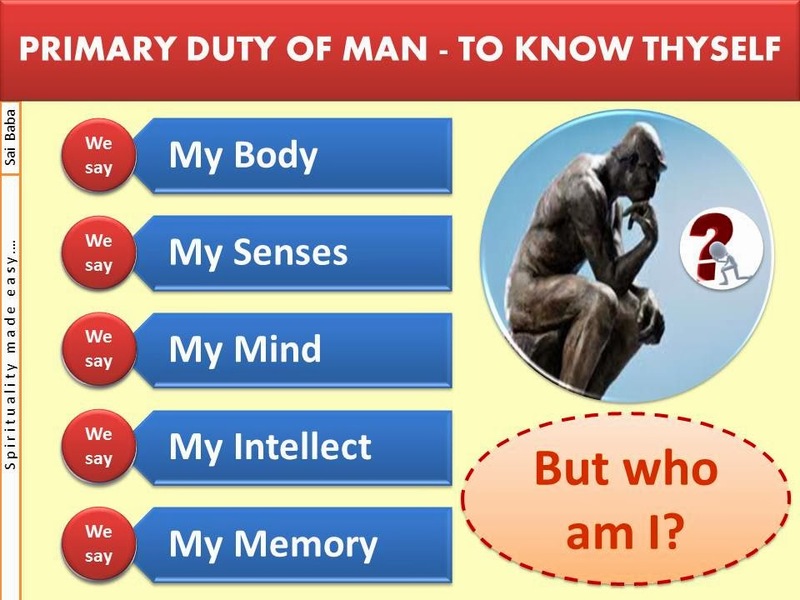 Aamnaayam means constantly thinking of and practicing the recitation of the root principle or the root syllable “Na”. As the knowledge of the Vedas can be propagated only through practice (chanting repeatedly), it came to be known as Aamnaayam and Samaamnaayam. The next title is Chandas. Chandas has certain meanings. One inner meaning of Chandas is that the Vedas have to be guarded in secret and propagated with care. Chandas is another name for the hymns of the Vedas. Sama Veda is full of Chandas. As the Vedas is full of such hymns it is referred to as Chandas. (The verses of the Vedas have a variety of different meters. They are grouped by the number of padas in a verse, and by the number of syllables in a pada. Chandas, the study of Vedic meter, is one of the six Vedanga disciplines, or “organs of the vedas”. There are several Chandas. The seven main ones are: Gayatri, Ushnuk, Anustubh, Brihati, Pankti, Tristubh and Jagati). Swaadhyaayam refers to the process by which the Vedas have come down from generation to generation, through great grandfather to grandfather to father to son, in genealogical succession. It is not just a matter of studying from a text. It is a tradition that has been transmitted from preceptor to disciple over the years merely through hearing. It is because this knowledge was handed down over generations as a tradition, it has been described as Swaadhyaaya. Gama and Aagama are the names given to the inhaling and exhaling of the Lord's breath, which are the origin of the Vedas. All in all, the Vedas are the very embodiment of the inhalation and exhalation of the breath of the Lord. The great sages who listened to these mantras as revelations from the Divine found the key to them in eight basic letters: Aa, Ka, Cha, Ta, Tha, Pa, Ya, Sa. What are the five types of knowledge? So students, what do you need to do primarily? Study well and concentrate on our studies. Recognize and develop discrimination with respect to that knowledge. Make an effort to put this knowledge into practice, to the extent possible. I have told a couple of times, there are five types of knowledge. However, students today are ending their pursuit (of knowledge) with just bookish knowledge itself. Some students go further and achieve the level of superficial knowledge. But there is a lack of general knowledge. Discrimination knowledge is totally absent. How then, can one acquire practical knowledge? Therefore, practical knowledge is very important. Because of lack of practical knowledge, our education is very artificial. Why is this world called Jagath? This world is called Jagath. Jagath means Jaa + Gath, Jaa + Gath i.e. to go and to come, to go and to come. Everything goes and comes. Nothing remains permanently. Nothing goes permanently. Whatever goes, comes again. Whatever comes, goes again. That is why this world is called Nityam (transient). It is also called Sadasat (neither true nor untrue). It is thus referred to as Jagath. We are experiencing this world in varied ways. It is not possible for us to leave this world. In this Jagath itself we need to see (have the Darshan of) Jagadeeswara (Divinity). Jagath (world) is the very form of Chaitanya (Awareness). This Awareness is verily the form of Divinity. What is the scientific significance for the practice of bursting crackers? There is a scientific explanation also (for bursting crackers during Diwali). The season that has just gone by is the monsoon season. Wherever you see, you find stagnated water and puddles of water. On account of this unhygienic environment, many germs and insects start increasing in number. Ill health starts progressing in humans because of these germs and insects. By bursting crackers, the fumes and the toxic materials kills these germs and insects. This helps man to be healthy and happy. Bharatiyas started all these festivities and practices with lot of inner significance. What is the scientific explanation for the existence of Demon Narakaasura? There is a scientific history (for the story of Narakaasura). There are many planets in the sky. Many planets revolve in this universe. But the nine planets (Navagrahaas) are very important for the planet of earth. There are many more sub-planets too. In the Dwaapara Yuga, a planet called Narakaa was moving very close to the planet earth. 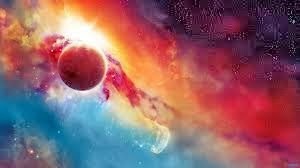 If this planet would crash into earth, the entire earth would be turned into ashes. In fact, even if the moon that is so cool would come even a few feet closer to the earth, the earth would be turned into ashes. There can be so many calamities. The planet Narakaa came very close to earth and was about to crash into earth. Witnessing the demon like planet that was about to destroy their world, all people started praying, “Krishna, Krishna, Krishna…”. At that time, the event wherein the planet Narakaa was destroyed and the world was protected is referred to as Narakaasura Samhaaram. Everybody considered Narakaa as a demon. Was any entity, which would destroy their world, not equivalent to a demon? Earlier the chancellor of Germany, Hitler travelled around the world. In those days, even he was considered as a demon. (Swami sings a lullaby in Telugu, the lyrics of which talk about Hitler waging a war on Russia, and Stalin ready to fight against his army, which mothers used to sing in those days to put their children to sleep). Similarly, in the Dwaapara Yuga, when the planet Naraka approached the earth, they believed it to be a demon. Lord Krishna killed the demon Narakaasura, as is explained in the scriptures, and he freed all those who were victims of the demon’s atrocities. 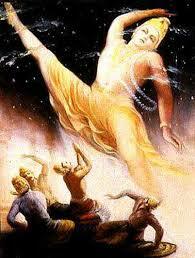 In other words, he destroyed the planet Narakaa and rescued all those who were to become victims of the planet crash. 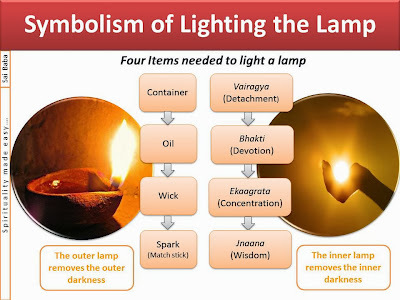 What are the four items required to light the lamp of wisdom? To light a lamp we need four items. One is the container, second is the oil, third is the wick and the fourth is the match box. Even if one of these four items is missing, we will not be able to light the lamp. All these four items are essential. But what type of darkness does this light remove? It dispels only the outer (physical) darkness. But how can we light the light of wisdom? In order to remove the inner darkness we need the Atma Jyothi (light of the inner Self-Atman), the Jnaana Jyothi (the light of wisdom). To light this lamp also, we need four items. Vairagya (detachment) is the container for this lamp, Bhakti (devotion) is the oil, Chitta Ekaagrata (one pointed concentration of awareness) is the wick and Tatva Jnaana (wisdom of the Atman) is the match box. Without these four, we cannot get Atma Jnaana. For all these, Vairaagya (detachment) is the most essential. It is the foundation for all these. Without Vairaagya (detachment), acquiring any type of education, any amount of studying of scriptures or studying of the Vedas, is of no use. Not by action, not by progeny, nor by wealth; it is by sacrifice alone that one can attain immortality. Who are our true family members? 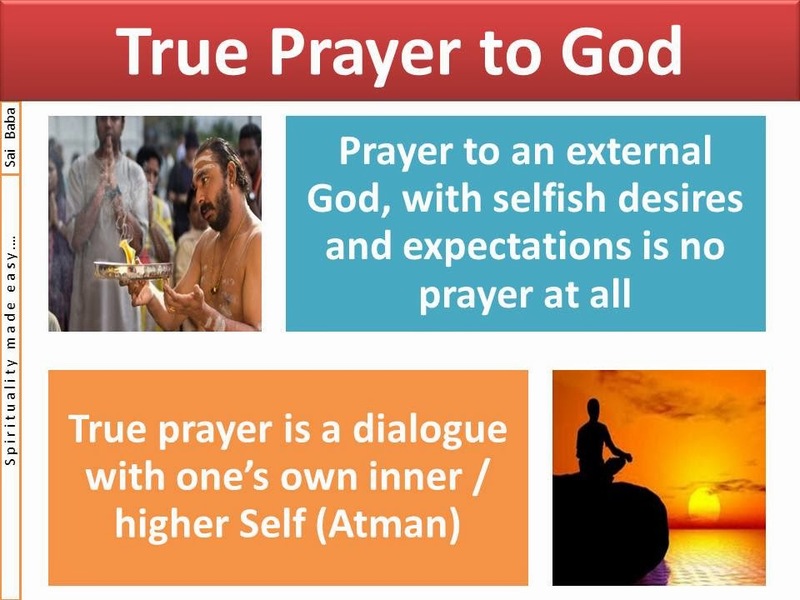 Satyam Maata – Truth is our Mother. In this world, every individual has a mother. But in this creation, for all human beings, there is one Mother. We must recognize that single Mother. 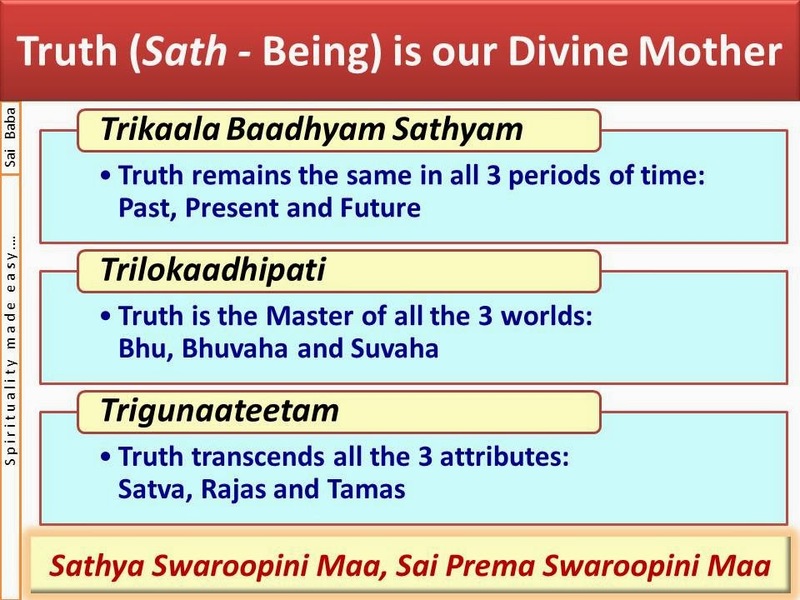 This mother – the Truth, is Trikaala Baadhyam – it remains the same in all three periods of time, it is the head of Trilokaa (the three worlds) and it transcends the three qualities or attributes (Satva, Rajas and Tamas). The physical mother may undergo change, she may change her geographical location and she may even die. But Truth as the Mother is always the same at any place, at any time and for any individual. Everybody must consider Truth as their Mother and it is necessary that they have faith in Her and follow Her. Pita Jnaanam – Next, who is the father? Wisdom is the father. There are many types of knowledge: viz worldly, material, scientific. But wisdom does not mean these. Adwaita Darshanam Jnaanam. Wisdom is that which confers the experience of oneness (non-dualism). This wisdom is Truth. Vedas refer to this as Satyam Jnaanam Anantham Brahma (Brahma is Truth, Wisdom and Infinity). Therefore, Truth is the very form of the mother for all. Wisdom is the father. Dharmo Bhraata – Dharma takes a different form for every nation, every religion, and every tradition. But for all human beings, for all nations and for all times, the brother who loves with a feeling of oneness is Dharma (Righteousness). This brother is the very embodiment of Love. It is in this context that right from the ancient times, in the country of Bhaarath, the Vedas have declared – Satyam Vada, Dharmam Chara (Speak the Truth, Practice Righteousness). So much importance has been given to Truth and Righteousness. Rama and Lakshmana being brothers set such an ideal for the world. At one point of time, when Lakshmana fell unconscious, Rama felt very sad. Rama declared, “Lakshmana, I may get a wife like Sita somewhere, I may even struggle and manage to get a mother like Kausalya, but I can never get a brother like Lakshmana again. It is because of having a brother like you, that the principle of Rama is shining so brilliantly. Therefore, Dharma is our brother. Dharmo Bhraata. Daya Sakhaa – Compassion is our friend. Today’s friends may turn into enemies tomorrow. We have been witness so many such experiences in the world. But, we can never find a friend greater than compassion. A true friend is the very embodiment of compassion. Shantah Patni – Who is the wife? Peace is the wife. Peace is the one that assumes the form of oneness and continuously shows unity in diversity, in all paths of life and in all living beings. Peace is the ornament of the Maharishis (great saints). It is the crown of the Rishis (saints). It is the royal path in the spiritual journey. Such peace is the wife (consort) for one and all. Kshama Putra – Forbearance is the son. There is no other nobler son than forbearance. Kshama is Truth, Kshama is the Veda, Kshama is Dharma, Kshama is Ahimsa (Non-violence), Kshama is Shaurya (valour). In this world, there is no power greater than Forbearance. 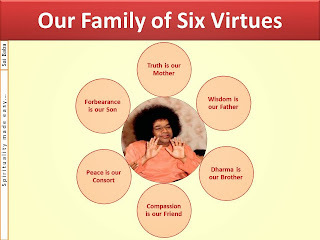 Therefore, Sathyam (Truth), Jnaanam (Wisdom), Dharma (Righteousness), Daya (Compassion), Shanti (Peace) and Kshama (Forbearance) – these six are the true relatives of humans. Today, on account of losing such a mother, such a father, such a friend, such a brother, such a wife and such a son, the world is subject to so much agitation and disturbances. What is our foremost duty in life? Embodiments of Love! First and foremost recognize your own Divine principle. Recognize the truth as to who you are. The one who recognizes His true Self can understand everything else. There are many new children here. You can recognize your true Self through many small ways. What is this? This is my cloth. This is my plate. This is my body. This is my mind. This is my intellect. But who am I? We say, my body, my mind, my intellect, my memory, my senses, my inner senses; but who am I? When we say, “my body”, it means the body is different and I am different. Then who are you? We need to recognize this truth. Body, mind and all these are mere instruments. Getting attached to these instruments and thinking that “I am verily these instruments” is so ridiculous. Therefore, the body, mind, intellect, memory, senses, inner senses, are all mere instruments. You are the Master. Master the mind and be a master mind. You must be a Master. You should never be a slave to your body, mind or intellect. Today, as man is becoming a slave to his body, mind and intellect; he is becoming a slave to everything. We must keep the body and the mind within our control and not the other way round. What is the genesis of the massive Grama Seva Project? In the earlier years, welfare of the villages was always in my mind. But actively engaged in the projects on education, health and water, I gave up village service to some extent. A month ago, when I was sitting on the chair, I saw a small piece of paper fallen there. I read the same. In that paper there was a photo of a mother and her son. The photo displayed their dead bodies. The mother could not bear the hunger of her son. The son came to her shouting, “Mother, I am hungry, I am hungry”. The mother replied, “Son, right now, it is raining everywhere”. This incident happened just last month. There was heavy downpour. Therefore, the mother could not even go out for begging. She said, “Son, because of this rain, I am not even able to go out for begging food”. There was no sign of the rain stopping. The mother wondered how she could feed her son. Not being able to withstand her misery, she took some rat poison, mixed it with water and prepared a strong dose. She fed her son with it, consumed the same herself and both died. This was published in the paper by someone. The papers too always catch hold of such bad news and they never fetch for good news. Even if they get some good news, they do not pay much attention to it. People who are lucky to be in a position to get good news and report the same, themselves commit such tasks. They search for negative news in every nook and corner and report the same. Neither do they get the thoughts to publish positive news, nor do their hands work towards it. The fate of their life is the very cause for this. The feelings of their parents (in their upbringing) are the main cause for this. I felt very bad. Chhee (an expression communicating disgust), this is the sacred nation of Bharath. This is the Tyaaga Bhoomi (land of sacrifice), Amruta Bhoomi (land of immortality). In this land of immortality, in this land that has acquired the name of Annapoorna (the giver of food), the mother not being able to feed her son with a little food had to kill herself. These feelings came to me. Immediately, I stopped all other work. We started cooking food and sending from village to village. I started giving joy and inspiration to the people in this manner. Our students also are like gold. They have taken up lot of difficulties. 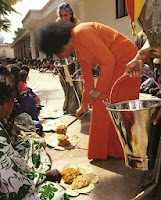 They go around from morning to night (distributing food) and yet return to the Mandir with great enthusiasm. They went to each and every house in each and every village. They provided all sorts of comfort for them. From then on, I have been feeling very very happy!! Who is our true Divine Mother? Embodiments of Love, Satyam Maata – Truth is our Mother. In this world, every individual has a mother. But in this creation, for all human beings, there is one Mother. We must recognize that single Mother. For this physical world, in this worldly life, it is very difficult to understand the transcendental principle. For every individual who travels on the Pravritti Marga (outward or worldly path), it is very necessary to understand Divinity. Every person has a Divine mother. For those who follow this Divine mother, there will be no obstacles or problems. 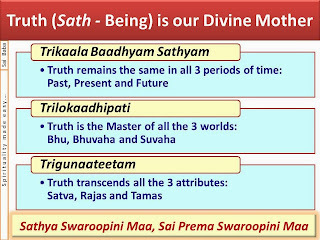 Satyam Maata – This mother – the Truth, is Trikaala Baadhyam – it remains the same in all three periods of time, it is the head of Trilokaa (the three worlds) and it transcends the three qualities or attributes (Satva, Rajas and Tamas). The physical mother may undergo change, she may change her geographical location and she may even die. But Truth as the Mother is always the same at any place, at any time and for any individual. Truth is the Divine, magnificent, novel, ever new Mother. Everybody must consider Truth as their Mother and it is necessary that they have faith in Her and follow Her. Truth never changes. It assumes the same form in all three periods of time. Everything is created out of Truth. 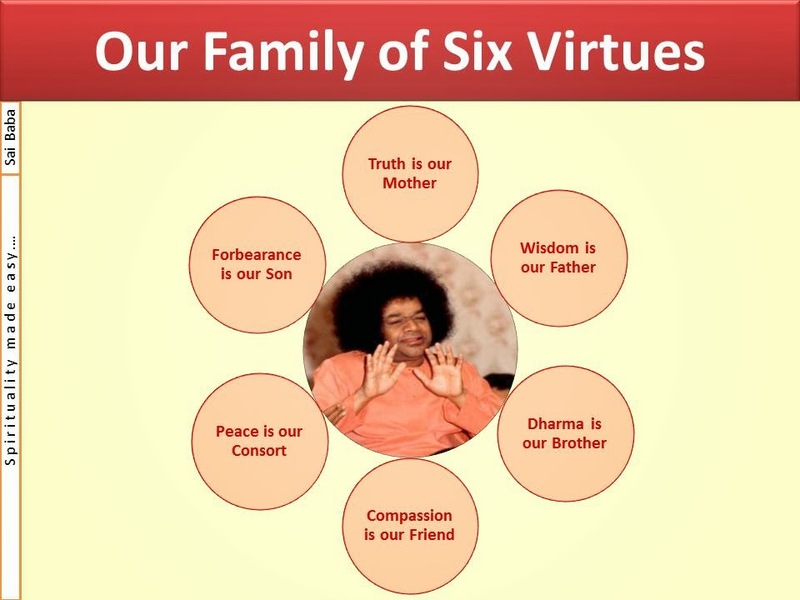 Being the Mother for everything (in creation), is Truth not your Mother? This Mother is eternal. She is nectarine. It is the great good fortune of mankind to have acquired such an immortal Mother. However, today mankind has lost such a sacred Mother – the Truth. The speciality of the worship we perform today is that we worship the Truth. We consider the Navaratri as the Devi Navaratri and regard Devi (deity) as the Mother. Devi, Devi – what is the meaning of Devi? Truth is Devi. The name of the Devi (deity) is Sathya Swaroopini. Every human being must recognize the Truth and practice the same. We must never give up Truth. Separation from the Mother is a very difficult experience. Without giving up Truth, when we practice the same, we will have victory in every field. During the Navaratri, we read the Devi Bhaagavatham, Devi Raamaayanam, Devi Bhaaratham and so on. We worship the Trinity of Goddesses - Lakshmi, Parvati and Saraswati. Who are these three? This trinity is also embedded in Truth only. There is nothing separate like matter and energy. Everything is One. Matter is energy and energy is matter. Without energy there can be no matter and without matter there can be no energy. Both are interdependent and interrelated. Therefore, it is a big mistake to refer to these as two. In fact, there is no matter at all in this world. Wherever you see, there is only energy, energy, energy – there is Shakti only. Other than Shakti (energy), no other object can be seen. That is why, today, as part of the Navaratri celebration, we worship Shakti (energy). Where does this energy come from? Truth is energy, Dharma (righteousness) is energy, Peace is energy; within Peace, Forbearance is a type of energy. All these constitute worship of Shakti (energy). Truth is the basis for all these. There is nothing beyond Truth. All forms of energy are embedded within Truth. Therefore, we must regard Truth as our very Mother. Matru Devi – if we forget such a Mother, what will be our fate? We must never forget the Truth which is our Mother. Worshipping the Mother actually means worshipping the Truth and following the Truth. We must follow Truth, we must speak the Truth. Satyam Bruyaat – speak the Truth. Practice Dharma. 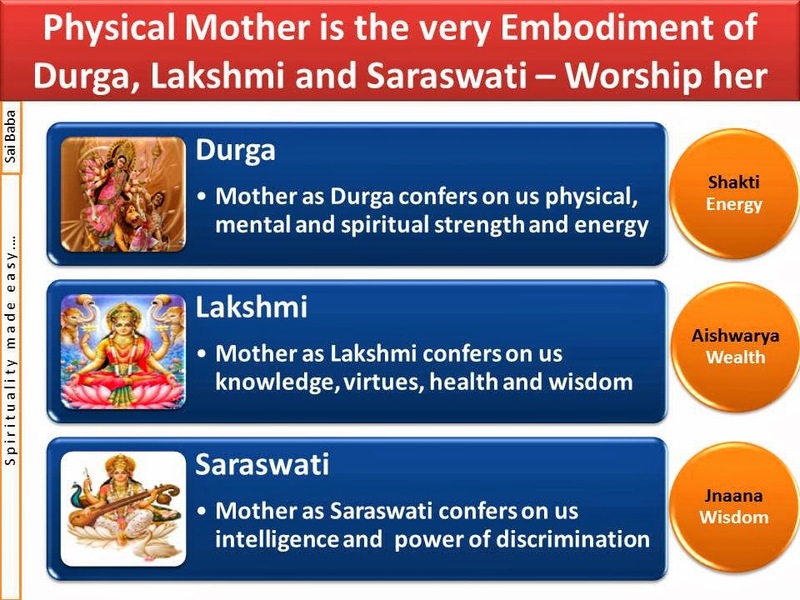 What is the inner significance of worship of the Mother during Navaratri? The mother is our true preceptor. The life of a human being who does not respect and worship such a mother is indeed futile. Therefore, it is the duty of every human being to respect and love the mother who is the embodiment of all powers. The festival of Devi Navaratri is an excuse to propagate this Divine message and to set several ideals to the entire world. The Goddess manifests in the form of Durga, Lakshmi and Saraswati. Goddess Durga means the embodiment of power. What form of power? It is physical, mental and spiritual power. Durga is the very form of power who bestows on us these three types of strengths. This is what we refer to as energy. Next is Goddess Lakshmi. She confers on us the wealth of Jnaana (wisdom), Gunaas (virtues), and several other forms of wealth that we experience in this world. Wealth or prosperity does not refer to currency notes alone. Jnaana (wisdom) is wealth, health is also a form of wealth, virtues constitute wealth, Vidya (education) is also wealth. Lakshmi is Sarvaaishwarya Swaroopini – the embodiment of all forms of wealth. That is why Lakshmi is called Wealth Swaroopini, Sampada Swaroopini or Aishwarya Swaroopini. Then we have Saraswati. She confers on us intelligence, power of discrimination and Buddhi (intellect). It is to present and propagate the glory of Durga, Lakshmi and Saraswati to the world that the festival of Navaratri is celebrated. Our mother is the very form of these three Goddesses. The mother is the one who confers all the energy and strength on her child. She loves her child and wishes for the development of her child into a prosperous, healthy, happy individual winning good name and repute in the world. She wishes that her son becomes a highly educated person with lot of intelligence and earns great repute in the world. The mother is the one who is the very embodiment of these three Goddesses – Durga, Lakshmi and Saraswati. What is the correct form of prayer to God? Many people visit temples. They go to the Venkateswara (Balaji) temple. 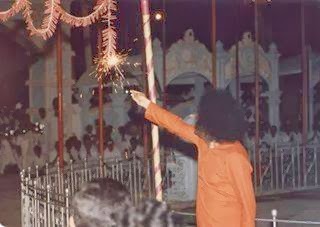 They pray, “Swami if you fulfil my desires, I will perform Brahmotsavam (a special ceremony) for you. 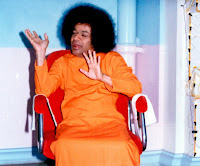 Swami if you get my daughter married, then I will perform your marriage.” Are you the person to perform God’s marriage? Will God fulfil your prayers / desires for the sake of His marriage? You are cheating God by offering Him such temptations. Praying to God with selfish expectations of some returns is no Love at all. 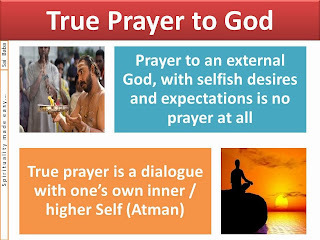 Without any expectations, (we must realize that I am) only one Atma, I am seeing my own Atman, I am talking to my own Atman, I am in the company of God; we have to develop and foster this oneness. 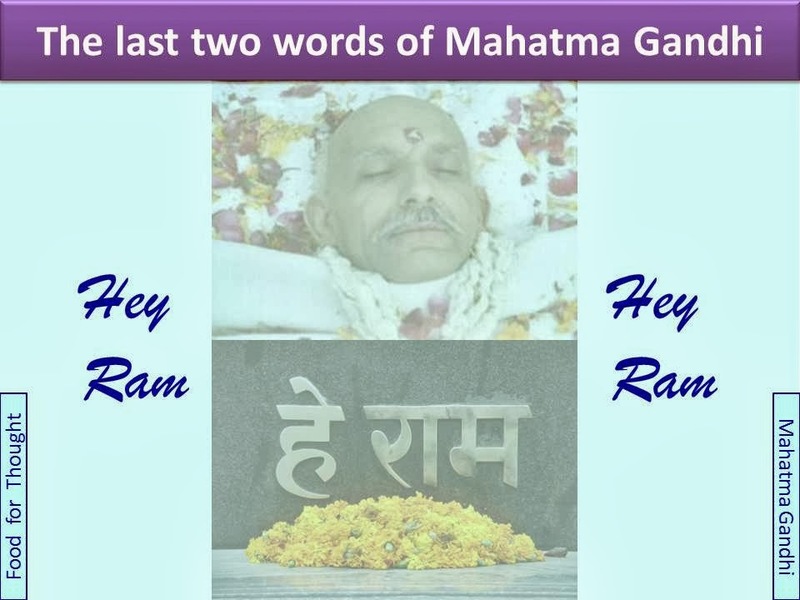 Who planted the seed of Rama Naama in Gandhiji's life? Once there was a mother who was very strict and duly punished her child as she brought him up (Swami is referring to Putlibai, the mother of Gandhiji). Yatha Raaja Thatha Prajaa (as is the king so are the citizens); similarly Yathaa Adhikaari Thatha Sevakulu (as is the master so are the servants). The mother who had a very sacred heart had a maidservant who was also very sacred at heart. Her name was Rambha. Rambha protected the children very carefully. One day, Gandhi came running to her. “Rambha, Rambha, I am feeling very frightened”, he said. Rambha drew him close to her and said, “Son, why do you fear? When there is Lord Rama the protector of all, why do you need to fear? Therefore, whenever you feel afraid, you chant the name of Ram, Ram, Ram, Ram”. 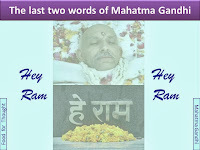 Gandhiji kept remembering this very name of Ram, to the very end of his life. Do we get such servants and helpers today? Those days, because such mothers and such maidservants were in large numbers, children too developed good qualities, good behaviour and walked on the righteous path. What is the meaning of the word Gandhi? In those days only few people associated with Gandhi and having formed the Congress party are claimed to have brought independence to our country of Bharath. But it’s not just that. Among our children, every one of them must become a Gandhi. The meaning of Gandhi is “Gan” + “Dhi” i.e. the development or the blossoming or the nurturing of the Buddhi – the intellect. This is what is referred to in the Gayatri mantra also as “Dhiyoyonah Prachodayaat”. Be it youngsters or elders, they must broaden their heart (i.e. have broad mindedness). That is true spirituality. One thing in the mind and another thing outside – such crooked feelings must never be entertained. What are the consequences of harming and hurting others? No one should hate anybody. Today in the world, on account of narrow minded feelings, there is hatred everywhere. One takes the life of the other. What a sin it is. It is equivalent to killing God Himself. This is very wrong. No one should hate anybody else. One’s hatred will hate one’s own self. You may feel happy that you hate somebody or you are hurting somebody. But that is not true happiness at all. That is demonic pleasure. In fact, make others happy; that will give you true happiness. That happiness is verily your true form. Do not hurt anybody. You may harm somebody today and consider that as your nature. But tomorrow (in the future) someone else will come who will harm you. What will be your fate then? Therefore, we must take care not to hurt anybody even without our knowledge. These days, this has become a big fashion. Hurting others has become a fashion, causing harm to others has become a fashion, killing others has become a fashion. Is it such a great act to kill somebody? Even an insect can kill a person. There is no greatness is killing somebody. Greatness lies in bringing life to somebody, in protecting others. If we go on killing others, what happens to our life ultimately? Finally, you too will die. How? 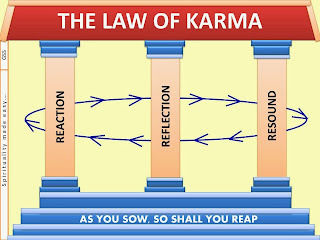 Based on the actions undertaken by you, the fruits of those very actions will come to you as the reason for your death. Therefore, embodiments of Love, one can never escape Reaction, Resound and Reflection. You may feel happy that you have escaped (from your bad actions) today; but tomorrow or the day after (in the future) you will receive the fruits of your actions. You can never escape this. Do good and you will experience goodness. Do not get disappointed that you have not experienced good results immediately; wait for a while, you will surely receive the good fruits of your actions. No man can ever escape the results of his actions. However, prayers can help to some extent when you are going through the bad consequences of your actions. That is gratitude. You must express gratitude. You must show gratitude and practice the same. Krutaghnaghnaaya Namah (Salutations to the annihilator of the ungrateful). 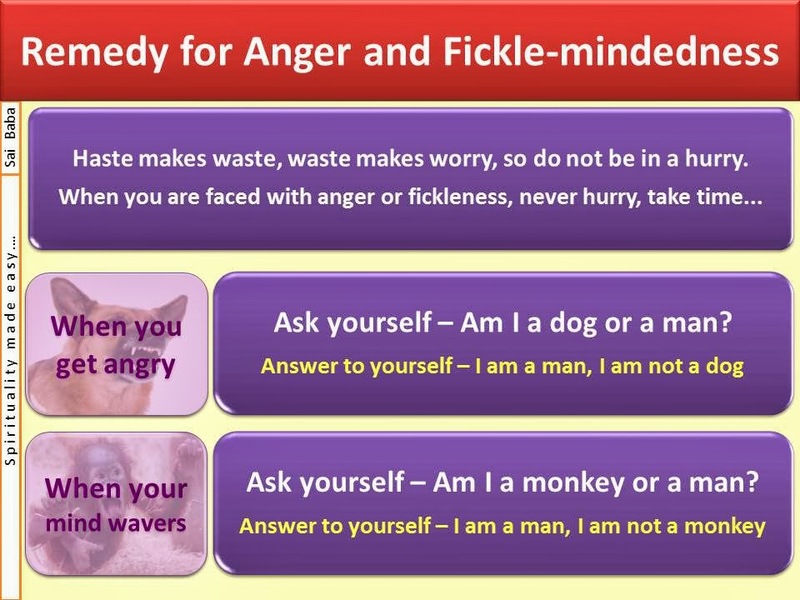 How do we manage anger and crazy thoughts? At times, your mind may start wavering, becoming fickle. At such moments, again take time. Do not be in haste. Haste makes waste, waste makes worry, so do not be in a hurry. We should not be in a hurry. When such crazy thoughts come to us, think like this, “I am not monkey, I am man; I am not monkey, I am man; I am not monkey, I am man”. Then your monkey thoughts will go away. For every bad quality or disease that arises in man, the divine remedy is found within him. All medicines for your bad qualities are within you. Once you develop good and noble qualities, the bad qualities will distance themselves away. Never submit yourself to the disease of bad qualities. What is the inner significance of the Onam festival? When the ego is surrendered, one achieves liberation! Bali replied to Sukraachaarya, “There is no greater sin than going back on one’s words”. King Bali disobeyed the command of his own preceptor and made a promise to Vamana. Emperor Bali struggled to uphold the truth. Thus, he was bestowed with all happiness and joy and was sent away to the netherworld. Being sent to the netherworld means having no more births. On that day, Emperor Bali prayed to Vamana for a boon. “Swami, just as You have conversed with me today, just as you have visited the land of Kerala today; in the same way, You must come to Kerala every year and protect the people of Kerala”. That is why the people of Kerala have named this day as Onam and experience happiness in celebrating the festival as a symbol of Lord Vamana’s visit to their land. Thus King Bali was a very virtuous person. Though he was born in the clan of demons, he had Divine feelings emanating in him. Because of his merits in his past life, the Kerala people were blessed with this festival of Onam. Onam is not merely about preparing sweet pudding and other sweet items and consuming them. We must recall the experiences that King Bali had with Lord Vamana. On this day, Vamana actually enters the land of Kerala. Considering Vamana as the Avataar of God, we must experience great happiness on this day of Onam. We must lead an ethical, spiritual and moral life. Satyam Bruyaat (speak the truth) – this is the ethical value. 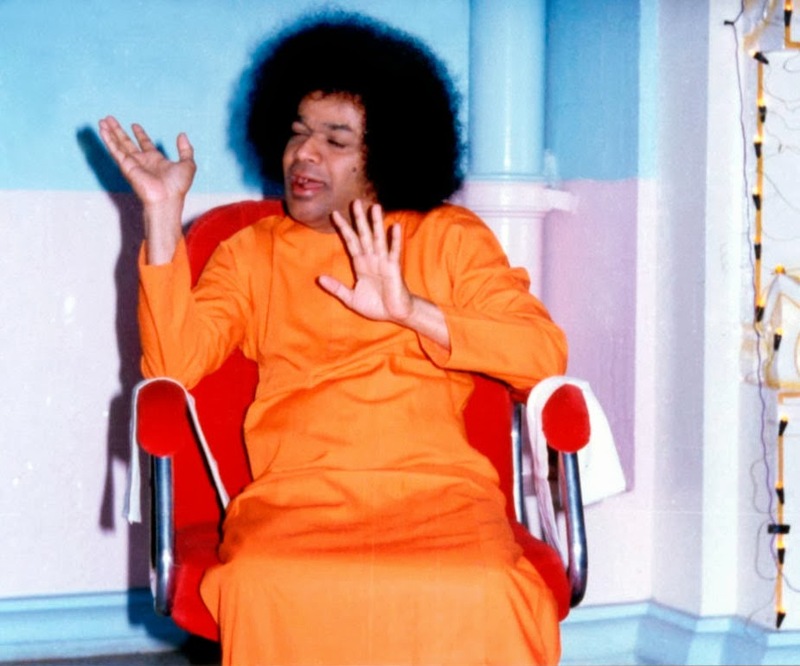 Priyam Bruyaat (speak in a pleasant way) – this is righteousness (the moral value), Na Bruyaat Satyam Apriyam (do not speak truth that is unpleasant) – this is the spiritual value. All these three are based on truth. Therefore, we must seek shelter under truth, experience a spiritual life, and perform actions for the welfare of the world. In the state of Kerala, till this day, though it is known to be a communist state, every individual is so full of devotion. Even today, they follow the spiritual principles like having a purifying bath, smearing holy ash on the forehead, wearing a sandalwood paste mark, visiting the temples, etc. The love and devotion observed in them cannot be seen anywhere else. Kerala is a beautiful state! Why does Swami often chide us as Dunnapota-He Buffalo? 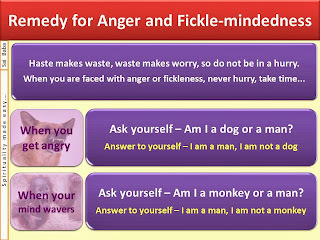 Whenever I appear angry, I am only acting as though I am angry, but I have truly no anger. At such times, when I appear angry, I scold them (students / devotees). How do I scold them? I call them Dunnapota (he-buffalo). My scolding is just that. Dunnapota means he-buffalo. You are a he-buffalo, because you are doing any good work. If you really do good work, then you will become a good-fellow (not a bu-ffalo!). My banging (scolding) is limited to only this! Dunnapota – all of you are Dunnapotas (he-buffaloes). Why? Because, you are not doing any good work. He-buffaloes do not bother even if it rains. A cow or a calf runs away when it rains, but the he-buffalo does not. It just stands at one place lost in thoughts. This means that, whatever criticism, blames, difficulties it may face, the he-buffalo remains just the same. There must be transformation in human beings. Only when there is transformation, they can be true human beings.